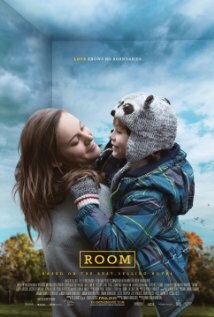 Movie Review: Brie Larson, who had already impressed me in “Short Term 12”, gives a spectacular performance, together with the young Jacob Tremblay, in the suspenseful drama “Room”, directed by Lenny Abrahamson (“Frank”) from a screenplay by Emma Donoghue based on her own 2010 international best-seller novel of the same name. The story follows a protective, caring mother, Joy (Larson), and her sensitive five-year-old son, Jack (Tremblay), whose lives are limited to a small space that they call room. The room is actually a shed, placed in a desolated backyard and well protected with a code lock system, which is owned by a man known as Red Nick, who seven years before had abducted Joy, confining her to a life of forced imprisonment. So, it’s easy to conclude that Jack is his son. The scoundrel father, who doesn’t have a job and only appears occasionally to bring food and sleep with the hapless woman, never has any contact with his son who is kept in a wardrobe until he leaves. The minimum accidental interaction between them leaves Joy out of control, in a raging effort to protect her precious son from the predator. The tiny room is actually the real world for Jack, whose unique contact with the exterior is through an old TV that is turned on whenever the power is available. His mother has told him that everything he sees on the TV is imagination and that beyond the room there’s just the outer space. Now that Jack, whose long hair made me easily mistaken him as a girl, turned 5, his mother decided to tell him the truth about the outside world, which naturally provokes confusion and apprehension. In addition, she engenders a risky plan to set Jack free and ask for help. The plan is consummated, however, the outside world is not the paradise she thought it would be, starting with the refusal of her own father in accepting Jack as his genuine grandson. A terrible depression takes care of this psychologically affected woman who does the best she can to hold onto life. For the film’s benefit, the mother/son relationship is depicted in a very strong way, a fundamental aspect that Abrahamson assures to extract from the performances, which are unquestionably Oscar-worthy. “Room” is an honest portrait of a terrible, abusive case, which reminds us a few real cases that have been disclosed by the media. Infused with confidence and narrative tightness, the film is not only gripping but also touching, and after two well-spent hours (time flies here, which is a good sign), it will leave you cogitating on the matter.